Nothing lasts forever and brake rotors are no exception. After all brake rotors face a lot of abuse every time you press the brakes. The time it takes for them to wear out completely depends on a number of factors: how easily the rotors cool themselves, the way you apply the brakes, the quality of the brake pads and their exposure to pollutants such as dust. 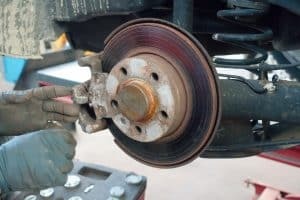 However, among the factors mentioned above, brake pads hold the most significant as they come in direct contact with the rotors every time you depress the brakes. That’s why you should avoid buying brake pads that have a high percentage of metal in them. Your best bet is to go for low-friction materials such as ceramic. Before we go on to clarify the rotor resurfacing and replacement argument. We need to talk about the characteristics of a good quality rotor. Manufacturers were very considerate of rotor quality earlier and as such, they gave out rotors that could last at least two brake pad replacements. However, the modern race to reduce vehicle weight and the cost have made brake rotors its victim. Manufacturers are now making thin rotors that wear out quickly. In some cases, brake rotors even wear out before brake pads. To counter this issue a minimum thickness specification is provided on the rotors. This specification is necessary to ensure safe braking. If the rotor has worn out to an extent that it doesn’t meet the minimum thickness requirements then it should be replaced. Otherwise, the brake rotor can be resurfaced and used again. Another big issue concerning brake rotors is uneven rotor wear. Uneven wear can happen as a result of aggressive driving. One side of the rotor can wear out more than the other and cause problems when you brake. In general, a rotor that has less than 0.002 inches of wobbling sideways is in good condition. This issue can be solved by resurfacing the brake rotors. IF the problem still exists then you can go for a replacement. Corrosion is your car’s sworn enemy. It is especially bad for rotors since they are an integral part of your car. Corrosion and rust can affect your car if you do not drive it for a long time. Brake rotors are the most prone to that damage since they are exposed to moisture and dust. You can feel the effects of rust when you first drive your car after a week or so. It is bad because it debilitates rotors over time, and you can hear screeching noises when you drive your vehicle the first time after a long time. The brake pads do remove rust from the rotors eventually but for a certain amount of time, your braking power is reduced. Brakes heat up if you apply them frequently during your drive. If they are used continuously, they lose their ability to brake effectively. This heat is caused by friction and friction is not your car’s best friend. The friction that is generated when the brake pad presses against the rotor needs to be dissipated efficiently for the brakes to work. This dissipation is carried out via small slits at the back of the rotor, also known as cooling fins. However, these vents cannot disseminate too much heat. If they fail to do so, your rotors can melt and your brakes can fail completely. Overheating in the rotors is caused by aggressive driving, going downhill and pulling heavy loads. You need to properly inspect your brake rotors every time you get your brake pads changed. The rotors should be measured to see if they meet the minimum thickness requirements and if they possess a sufficient amount of metal to ensure proper braking. If the rotor does not meet the thickness specifications, it should be replaced with a new one. Otherwise, if the rotors have any kind of cracks, or uneven wear or rust you can always have it resurfaced for cheap and get your brake rotors as good as new. Brake rotors can be resurfaced if they have any slight irregularity. However, resurfacing is not recommended in most cases as it can make your car’s brakes noisy. If you resurface a rotor you are essentially removing a layer of metal. This eventually makes the rotor so thin that it is not fit due to safety reasons. Hence, rotors should not be resurfaced every time you go to get your brake pads changed. It should also be kept in mind that not resurfacing the brake rotors when needed can lead to unnecessary high brake pad wear and tear. The uneven surface of the brake rotor can reduce brake pad life and increase your maintenance costs. Resurfacing is not very expensive though. Many mechanics charge only $20-$30 per rotor to resurface them. However, you could expect a higher price depending on the damage you have on your rotor. The availability of OEM parts has made it easier for the average car owner to replace car parts without spending too much money. In some cases, replacing a brake rotor is cheaper than getting it resurfaced, especially if you are a DIY mechanic. Resurfacing at home can cost you a lot of money, so you are better off making a replacement rather than resurfacing. To your good luck, new rotors are very easy to install. There is no need to prep them for the installation as they are already perfectly finished. All you need to do is remove your old rotor and install the new one and you are good to go. It should be helpful to keep in mind that the cost of replacement will differ depending on your car’s make and model. 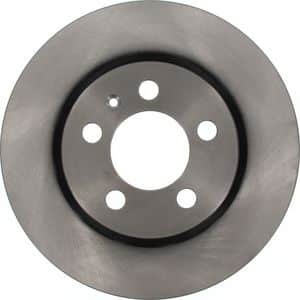 A genuine brake rotor in an average daily sedan can cost $140 or more. Whereas, a genuine rotor for a luxury vehicle could cost you more than $300. In essence, it is up to you what you prefer. If the resurfacing is more cost-effective for you, then go for it. Otherwise, always look for a replacement after you have resurfaced the brake rotors twice.